Ayrshire Scotland Business News: Vicente for Scottish Grand National hat trick? Vicente for Scottish Grand National hat trick? 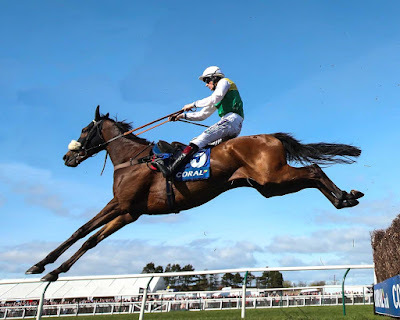 VICENTE could attempt to be the first horse to win three consecutive Coral Scottish Grand Nationals at Ayr Racecourse in more than 100 years after being named as one of 78 entries in this year’s race. The last horse to claim that honour was Couvrefeu II, whose glory run came in 1911, 1912 and 1913 and now trainer Paul Nicholls is eyeing making his own bit of history with the Trevor Hemmings owned nine-year-old. Vicente, quoted at 14-1 by sponsors Coral, first won the race in 2016 as a seven-year-old, and repeated the feat last year, with Sam Twiston-Davies riding on both occasions. Cogry and Benbens, both trained by Sam’s father Nigel, second and third in the race last year, also hold entries for the £215,000 contest, while Missed Approach, trained by Warren Greatrex and the winner of the Kim Muir at Cheltenham last month, looks set for the Ayr feature. Leading Irish trainer Gordon Elliott, who won the Irish Grand National earlier in the week with General Principle has entered Fagan, owned by Scottish businessman Ronnie Bartlett, and Folsom Blue. West country trainer Colin Tizzard, whose Native River recently won the Cheltenham Gold Cup, holds five entries including Sizing Codelco and Sizing Tennesse. Lucinda Russell will attempt to win her first ever Coral Scottish Grand National with the highly talented Big River. Champion trainer Nicky Henderson has three entries, with the most notable being Beware The Bear, fourth in the Ultima Handicap Chase at Cheltenham last month. The main supporting contest on the day, the £105,000 QTS Scottish Champion Hurdle, has attracted 49 entries with some very highly rated hurdlers among them. Last year’s winner Chesterfield, from the Seamus Mullins yard, is set to defend his crown, while the 2016 winner Ch’tibello trained by Dan Skelton also holds an entry, and others that take the eye include the Nicky Henderson trained Jenkins and Kevin Ryan’s progressive five-year-old Beyond The Clouds. Coral make another Nigel Triston-Davies trained horse Ball optic, fourth in the RSA Novices’ Chase at Cheltenham, the early 12-1 favourite. For further information please contact Iain Ferguson on 0101292 294972 or 07795 565691.